Located between the villages of Stockbridge, Housatonic and Great Barrington. Most unique Riverhouse property located on the bank of Rising Pond of the Housatonic River. Built around 1860, the Riverhouse has been updated and outfitted for modern-day convenience but retains its charm and unique appeal. From original painted-board floors and claw-foot bathtub with shower to modern amenities this property offers spectacular views of foliage and wildlife from the deck, picture window and bathroom of this upstairs artist’s aerie, filled with original art by local artists. The only house located directly on the banks of Rising Pond of the Housatonic River, it offers spectacular views of fall foliage and wildlife and makes for an authentic Berkshires experience. Easy access from the bank of the property for small boating and sculling. Located in the heart of the Berkshires; the Appalachian Trail, Tanglewood, Shakespeare and Co., the Rockwell Museum, Chesterwood, summer stock theater, music, and dance are all just minutes away. Easy access to Butternut Ski 5 miles and Catamount 12 miles. Fully equipped kitchen with all cooking utensils and serving dishes make eating on the deck and entertaining a delight. Walking distance (1/4 mile) to the fabulous Berkshire Mountain Bakery with delicious french pastries and bread for your morning coffee and take away pizzas for easy meals. Taft Organic Farms is 1.25 miles down the road for local products and produce. The open floor plan and lovely views make this efficient upstairs apartment seem much larger than it’s 700 square feet. The two private bedrooms include twin beds that can be made into a king in the first and a queen-size bed in the second. The large bathroom features an antique full-size claw foot bathtub (with shower) that gives out to a incredible view as you soak! Full laundry facilities available. Parking for two cars. Smithsonian Magazine has voted Great Barrington one of America's 20 Best Small Towns! Find out for yourself...a hidden gem. Feel free to contact me directly for information and reduced rates by way of "Ask Owner a Question" located under "Request to Book" where you can find my email address. Leaf peeping, Christmas, New Years: $185/night (3 night min); $1000/week. No refunds for cancelling unless we are able to re-book the dates. Guests reserve months in advance for high season and we lose many opportunities to book when we take your dates off the calendar. We hope you can understand our position. For additional lodging space/options for larger parties. Either of the above fully-equipped, beautiful properties will easily accommodate 4 more if you are traveling with a larger group and need more space and/or more privacy. Keywords: Stockbridge, Housatonic, River house, Great Barrington, Housatonic, upstairs apartment, spectacular view, 2 bedrooms, Tanglewood, Berkshires, unique property, river view, water view, sleeps 4, full kitchen, Butternut, Catamount, Kripalu, Charcoal grill. We live in Dallas, Texas most of the year but try to spend as much time as possible in the Berkshires now that Chris is recently retired. Have you seen the pictures?! This is a very special property with the most spectacular 24/7 year-round views of foliage and wildlife. The only house located directly on the banks of Rising Pond, my mother in law bought and saved this house from falling down 15 years ago. We acquired it 6 years ago and consider it home...not just another rental property. Conveniently located. Quintessential Berkshire experience. Monument Mountain across the street! Foliage and wildlife! Binoculars available. This is the only residence located on the banks of Rising Pond along the Housatonic River. Fully equipped with all necessary cooking/serving utensils and appliances. Shore access to Rising Pond. Bring your own canoe or kayak! Small attached deck overlooking Rising Pond. Spectacular Berkshire foliage vistas and wildlife just outside your window. Perfect for morning coffee or cocktails at sunset. Be aware of steep-ish staircase up to apartment and tall claw foot tub which may be difficult for anyone with limited accessibility. Lovely deck with table and chairs offering idyllic views. Located upstairs in historic house built in 1860. Not handcapped accessible. Be aware the property is located on the riverbank and near a road. Small children must be supervised at all times when outdoors. Centrally located to summer cultural events and winter sports venues. Very good cell phone coverage with ATT and Verizon. Beautifully restored apartment with many thoughtful and artistic touches. We found everything we needed. Spotlessly clean. Great use of space and incredible view. Thank you, Anna, for taking the time to write such a nice review. We hope you and your family can return again soon! The space was perfect for me and my girlfriend. The kitchen had all the necessities for cooking. It was just close enough to town for us to easily get anything we could have needed though the house was fully stocked with all the basics and even a few extras we had forgotten ourselves! It was clean and well kept and even historical. The view was spectacular and the owners always made themselves available for anything we could have needed. They even left a little book with places to eat and things to do. Overall a great experience and if we go back to Great Barrington we would not hesitate to stay there for another trip. Very, very impressed. Along this stretch of the Housatonic River, this vacation rental is the only home that's right on the river, making for spectacular & unobstructed views. There are the islands where geese, blackbirds, & a heron hang out, & thick woods on the other side of the river. Add to that a very bright & pleasant 2 bedroom apartment . 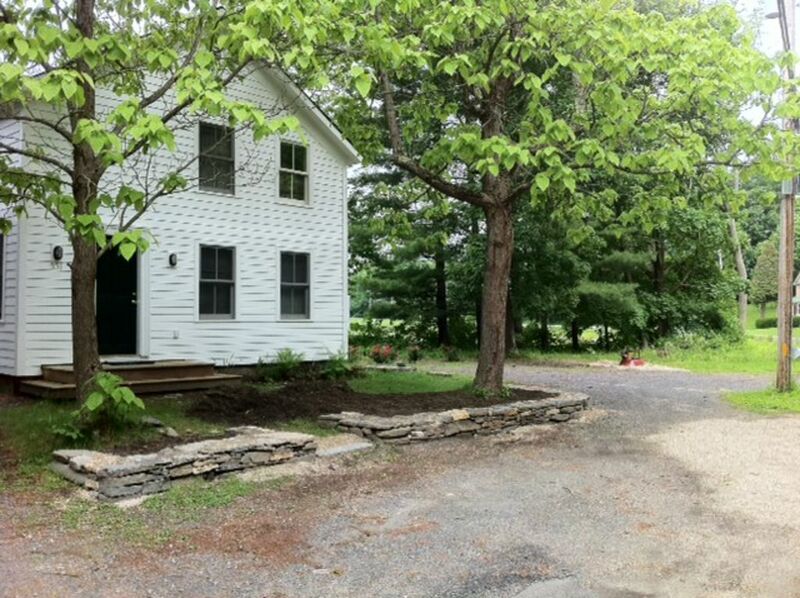 . . + nearby Great Barrington, Tanglewood, Jacob's Pillow, & Lenox. Oh, then there's the ultimate attraction, a bakery 1/2 mile up the road. A great spot . . . delightfully unique. This was my 3rd stay at Riverhouse, enchanting as ever! Immaculately clean, well appointed airy overlooking the widest part of the Housatonic River. Sunsets are stunning, birds glide in and out. Easy walk to town or the legendary Berkshire Mountain Bakery. Only minor complaint: LR furnishings are limited and there's no comfy way to stretch out and read, except for in bed. This place has my heart. We stayed at the Riverhouse for two and a half weeks this autumn. We loved the quite retreat but so close to a lot of great attractions and activities. Perfect choice for a relaxing getaway with options for activities when you choose. Great coffee just a hop and a skip down the road. We stayed at the Riverhouse for two separate weeks over the summer. The view of the river is very beautiful and tranquil. The Riverhouse is very comfortably furnished and immaculately clean. It contains everything you need for an easy stay. Tanglewood and other venues are an easy drive away. The best croissants are a short stroll down the road. Riverhouse is the perfect choice for vacation. 5 miles to downtown Great Barrington and 6 miles downtown Stockbridge, Tanglewood 9 mi., Jacob's Pillow 19 mi., Shakespeare and Co. 11 mi., Rockwell Museum 4 mi., Chesterwood 6 mi., Monument Mountain, numerous swimming lakes nearby, Appalachian Trail, Biking, Butternut Ski Area 5mi., Kripalu 8 mi., Catamount Ski 12 mi. $1300/week July 1-September 11(one week minimum rental) $750/ week September 13-June 11(3 night minimum $450) Shorter stays in high season possible with availability at $200 a night. $75 cleaning fee $500 refundable damage deposit Long term stays at discounted rate. Please inquire.